If you are having trouble saying sorry, we have the solution here at Balloon in a Box! So, if you have dropped your mum's vase, crashed your dad's car or forgotten your Anniversary we have the balloon for you! Send as a single balloon or as a bouquet. 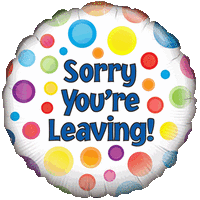 We can get your sorry message balloon there tomorrow (see our delivery section for details). An I'm Sorry Balloon is the best choice for erring humans on the web! 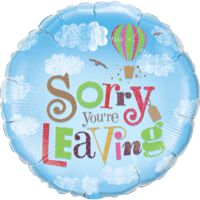 This Superb You're Leaving 18" Balloon Gift will intrigue and thrill a lucky family member or friend! Expertly put together and blown up by our in house qualified balloon decorators! 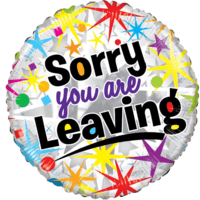 This Superb 18" Sorry You Are Leaving Colourful Balloon Gift will intrigue and thrill a lucky family member or friend! Expertly put together and blown up by our in house qualified balloon decorators! 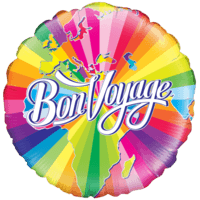 This Superb Colourful Bon Voyage Balloon Gift will intrigue and thrill a lucky family member or friend! Expertly put together and blown up by our in house qualified balloon decorators! 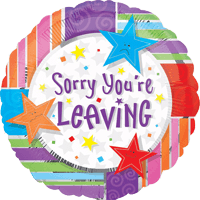 This Superb Sorry You're Leaving Spots Balloon Gift will intrigue and thrill a lucky family member or friend! Expertly put together and blown up by our in house qualified balloon decorators! This Superb Regrets - You're Leaving Balloon Gift will intrigue and thrill a lucky family member or friend! Expertly put together and blown up by our in house qualified balloon decorators! 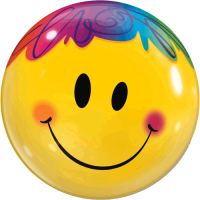 This Superb Clown Smiley Face Balloon Gift will intrigue and thrill a lucky family member or friend! Expertly put together and blown up by our in house qualified balloon decorators! Heads up! Unfortunately we're currently out of stock for balloons in this category. Please choose another balloon or check back soon. Balloon in a Box has been sending out balloon delivery gifts for over 10 years, so it's fair to say we're experts at what we do. Rest assured that when you order with us, you're in good hands. You can call us on 0845 486 2060 or, if you're calling from overseas, on +44 113 359 3144. Calls are charged at local rate. Alternatively you can send an email to sales@ballooninabox.co.uk or submit an online enquiry by visiting our contact us page and we'll get back to you ASAP. Anything else we can do? If there's anything else balloon related, that you can't find on this site, please give us a call and we'll sort it out for you. We can print balloons, supply you with helium, help you with party balloons and much more.